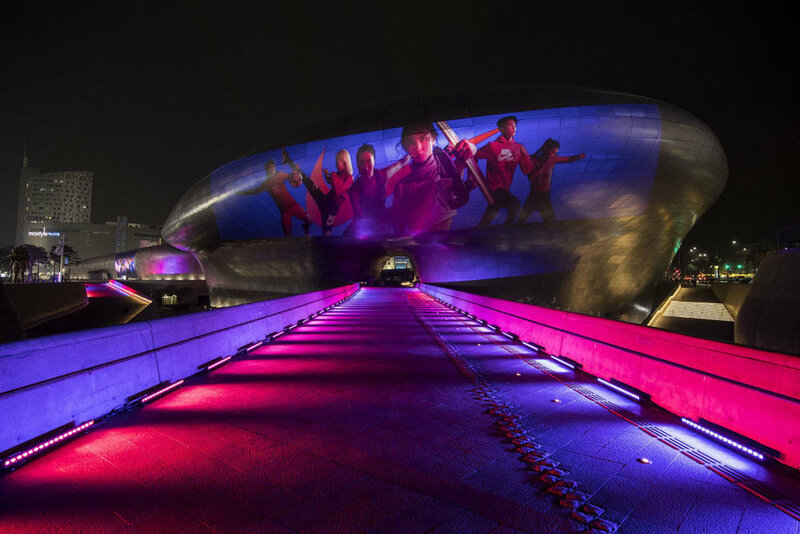 Dongdaemun Design Plaza in Seoul, South Korea, lit up to mark the launch of the first running footwear models to feature Nike React cushioning. Photo credit: Nike, Inc. The imminent arrival of 2019 put me in a sentimental mood, and so I began to reminisce on the year that was. As batshit crazy as 2018 has been from a geopolitical perspective, skimming through the 7,400-plus photos I took this year (almost exactly one thousand more than I snapped in 2017) reminded me how fortunate I am and how much I have to be thankful for on a personal level. On a professional level, this stroll down memory lane also reminded me that I had a pretty amazing work experience at the very start of the year. I’m incredibly lucky in that I periodically have the opportunity to represent the efforts of my Nike teammates at product launch events organized by our remarkable brand and communications teams. These events can vary dramatically in scale based on the scope of the story we have to tell—from small briefing sessions with a handful of participants up through auditorium filling affairs. This past January, Nike Running took the latter route to launch our first line-up of shoes to feature the new Nike React cushioning platform. The events took place in Asia, Europe and North America, and I was offered the privilege to lead the launch presentations in Asia—specifically, in Seoul, South Korea and Shanghai, China. The experiential half of the presentation space at the Dongdaemun Design Plaza in Seoul. This side of the presentation space offered several interactive experiences that attendees could engage with, each of which highlighted a key benefit of Nike React. I snapped this just a few minutes before our first presentation, so it was very much the calm before the storm. No matter how many of these things I get to take part in, they never cease to amaze. Our brand and comms teams somehow manage to consistently top themselves, securing incredible venues and transforming them in record time into site-specific experiential installations. As a presenter, I pretty much get to just show up and be made to look brilliant thanks to the efforts of this army of people who do all of the actual work but get none of the shine. Aside from presenting our new products, a key responsibility at these confabs is participation in one-on-one interviews with members of the media. Some find this task onerous, but, perhaps because I know what it’s like to be on the other side of the microphone from my days running Kicksology.net, I actually enjoy these sessions. I can tell you from direct experience that it’s a lot easier to be the interview-ee than it is to be the interview-er. Here I am earning my keep at the Nike React launch event in Seoul. As a presenter, I pretty much get to just show up and be made to look brilliant thanks to the efforts of an army of people who do all of the actual work behind the scenes. Photo credit: Riley Wolff/TEMPO. Sure, I have to make certain to remember my key talking points and find ways to work them into the conversation without seeming like I’m just regurgitating talking points. But that definitely beats stressing out over whether or not I remembered to charge the batteries in the recorder; or have enough storage space on the camera; or asked all of the question I meant to ask, all while actively listening so that I can ask effective follow-up questions. Just thinking about those days ties my stomach up in knots. Much respect to those working the media beat, which is far more complicated today than those quaint days of yore when simply maintaining a blog was considered cutting edge! 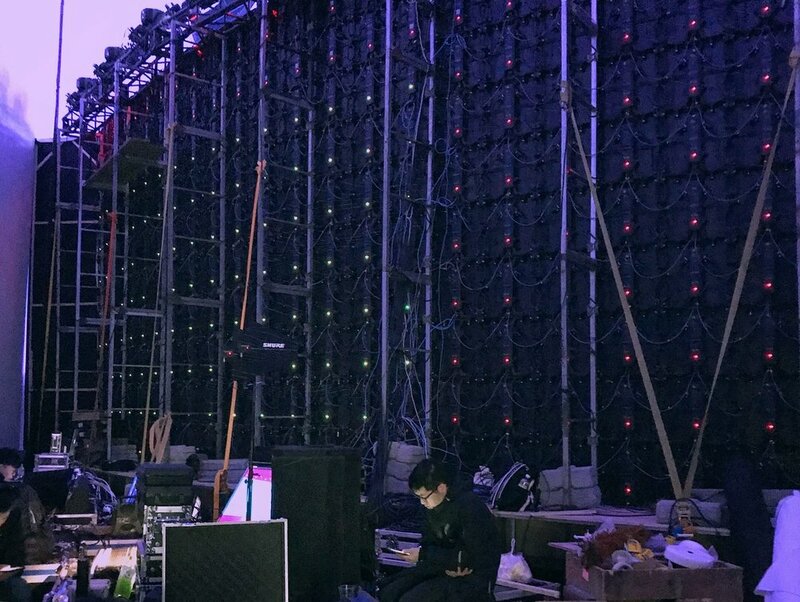 Here’s the presentation venue for the Nike React launch event in Shanghai. You don’t really get a sense for the scale from this photo, but this screen was HUGE—I mean, nearly the size of an IMAX screen huge. It looked amazing, but, perhaps unsurprisingly, it put off a ton of heat. The venue itself was pretty chilly, but, by the end of my presentation, I was in a full sweat—not because I was nervous, but because standing next to that screen was like standing next to the sun. Speaking of blogs, of these interviews, my favorites are always with the sneaker bloggers—or perhaps the term “blogger” is passé, given that few these days actually publish blogs, with most instead focusing on platforms like YouTube, Instagram, or Weibo? I guess it’s more correct to simply say that my favorite interviews are with the true sneakerheads. No disrespect intended towards the mass market media folks, but, given that their audiences are, by design, very broad, they tend to ask very broad questions (“What was the ‘aha’ moment?” is a staple). The sneakerheads, on the other hand, really want to know about the nitty-gritty of the development process and, as a product geek, that’s the sort of stuff I love to talk about. Here’s a literal look behind the screen. It would be interesting to know how many miles of cable are required to get this monster up and running. It looks crazy, but it ran perfectly through a full day of presentations. I was happy to see that the Nike React launch events in both Seoul and Shanghai included quite a few sneakerheads. I wish I could remember the names of all of the wonderful people I met, but two interactions do stand out in my memory. The first is an interview I did in Seoul with Ryan Wolff from TEMPO, which, at that time, was a very new, running-focused publication based out of Melbourne, Australia. TEMPO is geared towards serious runners, but I think it’s fairly unique in that the team behind it recognize that there’s a cultural component to the sport that’s at least as important as the performance side. Ryan was also very clearly a sneakerhead, and it was fun to talk to someone who was as interested in how our Nike React products fit into the broader sneaker culture as he was in their performance bona fides. Like the event in Seoul, the Shanghai launch event included experiential elements as well. Here, a room bordered by video displays and filled with balloons brought to life the cloud-like cushioning offered by Nike React. These images don’t do the experience justice, but hopefully they give you at least a taste for the amazing work done by Nike’s brand & communications teams in support of product launches. Then, in Shanghai, I had a great conversation with the team from ULSUM. They were genuinely interested to learn more about the products we were launching and, not only how we arrived at our ultimate solutions, but why we arrived at those solutions. Perhaps due to the pressure to be the first to publish, a lot of outlets don’t go beyond asking about the surface attributes of our products, so it was refreshing to have an opportunity to dig into the why behind the what. ULSUM recorded our interview and have since published it to their YouTube channel, and I’ve embedded that video below. If you view through to the end, you’ll notice that I managed to sneak some watch-talk into the conversation as well! Those are just two memories from a year that was more eventful than most. Honestly, I would have sworn that these Nike React events took place in 2017, as way more than the typical twelve months worth of stuff has happened over the past year. As exciting and edifying as 2018 was, here’s to hoping that 2019 is a few degrees less turbulent and tumultuous—more late-period Roger Federer than peak Andre Agassi. 2019: The ball is now in your court! “Roma” is phenomenal & demands to be seen in a theater. First, this isn’t a review, so I’m not going to give anything away about Alfonso Cuarón’s latest film, Roma. Indeed, I went out of may way to go into the movie knowing as little as possible about it, and I’d strongly recommend that you do the same. I rarely get evangelical about viewing modalities, but if there’s any way to do so where you live, please get yourself to a real theater to see this. So much of what’s special about it—the widescreen compositions, the complex sound mix, the fluid shifts in scale—would be lost on a home TV screen, much less a laptop. Roma is hypnotic and transporting and sublime, everything a movie seen on the big screen ought to be. Seeing it in a theater will not only give you a far better experience of the film itself, it’ll demonstrate to Netflix—a company many in the film industry regard as an existential threat to their art form—that audiences still consider some movies worth leaving home for. I’ll just add one more thing, which is that seeing any film in a theater is a forcing function for focus. And, I’ll be honest, I found the first 20 minutes or so of Roma to be very slow. “Is this movie actually about anything?,” is a question that came to mind over that span. Well, it turns out that the movie is about everything, which is what makes it so deeply affecting. And the film’s laconic introduction is key to that impact, because it draws you into the life of its main character strand by strand, so slowly that by the time key events occur in that character’s life, you feel the weight of those events with her and perhaps even as her. Had I been watching Roma at home on Netflix, I’m certain that my focus would have wandered during those seemingly inconsequential opening 20 minutes or so, to the great detriment of my experience of the film as a whole. So, please see Roma and, if at all possible, see it for the first time in a movie theater. Here in the Portland area it’s showing at the wonderful Hollywood Theatre (they only list showtimes through December 20th, so you may have to hurry). The official Web site for the film includes a search feature so that you can find a screening near you, but it didn’t offer up the Hollywood Theatre when I searched in Portland, so you may be better off simply Googling “Roma movie showtimes.” And, if you do manage to see Roma in a theater, let’s talk about it—hit me up on Twitter @edotkim and tell me what you thought about it. People who know me know that I’ve recently picked up a really bad case of watch fever. Hopefully it’s not terminal, but it’s bad enough that, over the past year, I’ve accumulated enough watches to need a way to safely house and transport them all. To that end, I recently purchased something called a watch roll from a fantastic company out of South Carolina called Hub City Vintage. And I liked that first roll so much that I went ahead and purchased two more. My experience with the Hub City Vintage family of watch rolls inspired me to create this video review. Give it a click if you’d like to learn more about watch rolls, discover why the watch lover in your life might need one, and why I think the Hub City Vintage family of watch rolls is perfect for the type of person who, like me, never thought they’d find themselves buying a watch roll. If you follow me on Instagram, you’ll have seen the two videos I posted showcasing a shoe called the NikeLab Veil that my team at Nike designed, developed and helped bring to market. Those brief snippets elicited tons of questions, so I created the long-form video embedded here to share answers and to provide an in-depth look at the shoe. If you have any interest in the NikeLab Veil or in how modern-day athletic shoes are made, please give it a watch. And, afterwards, don’t hesitate to shoot any follow-up questions or feedback my way on Instagram or @edotkim on Twitter. Diagnosing the ills of Apple Watch through the lens of Clayton Christensen’s jobs-to-be-done framework, and prescribing a new path forward that can truly make a dent in the universe. Those who’ve read my generalist’s review of Apple Watch will know that I was an early adopter of the platform. Though I had long ago given up wearing a wristwatch, I was intrigued by wearable technologies in general and the potential for Apple Watch in particular, so I pre-ordered a Watch in April of 2015 and, upon receipt of my 42 mm model with the stainless steel case, I wore it all but daily for the next year-and-a-half. As noted in my review, which was written after four months with the device, there were a few things I really liked about Apple Watch and a few things I strongly disliked. On balance, I wasn’t fully won over, but I decided to soldier on with it, partly in the hope that future software updates would address my issues and partly in the expectation that the Watch would simply grow on me. After all, it had been years since I’d worn a watch of any kind, so it seemed reasonable to expect that it would take some time to re-acclimate to strapping a gadget onto my wrist every morning. Here’s a look at my first generation 42 mm Apple Watch in stainless steel with a white fluoroelastomer band (note that the Bluetooth headphones were not included with the Watch). This combination retailed for $599 USD when it launched in April of 2015, but the price of this configuration was dropped to $549 with the launch of Apple Watch Series 2. Months stretched into over a year with the Watch and, over that span, instead of warming to it, my feelings only grew cooler. For starters, Apple failed to release any meaningful improvements to its user experience: I dutifully upgraded my Watch with each “major” software update, but found that they only nibbled at the edges of the device’s fundamental shortcomings. It remained cumbersome to use, compelling apps remained MIA and I hated having yet another device to charge every night. What surprised me, though, was that as grating as those issues were, the one that came to dominate my personal list of Apple Watch gripes was its aesthetic. The reason for my surprise was that I’ve never been a jewelry guy: For years, the only ornament I’d worn was my wedding ring and, back in the olden days when I did wear a watch, I invariably gravitated to the most basic, utilitarian styles. On top of all that, I’ve long been a fan of Apple’s spare, Bauhaus-inspired industrial design aesthetic. So if anyone were to like the look of Apple Watch—which is essentially an iPhone in miniature—it should have been me. And yet, as noted in my review, I felt that even my $599 stainless steel model “lacked a sense of occasion,” and I just couldn’t connect with it as a fashion statement, which is precisely the sort of thing I never envisioned myself saying. It’s worth noting, too, that this lack of connection wasn’t for lack of effort or investment. Finding the Watch’s included fluoroelastomer band good for fitness but lacking in expression, I took advantage of the device’s fantastically well engineered mechanism for changing straps and, over time, purchased Apple’s Milanese Loop, Woven Nylon and Classic Buckle bands. Including the Watch itself, that meant I had spent over $900 in an effort to create a version of the device that I genuinely wanted to wear rather than a device that I felt obliged to wear. As you might have guessed by now, I never quite got there. The saddle brown “Classic Buckle” almost had me convinced—its supple leather, fine stitching and high-polish stainless steel lugs (the part of the strap that attaches to the case) brought some much needed warmth and allure to the Watch. But its net effect on my soul was more smoldering campfire than raging inferno. By this point, I’d already stopped using my Watch to track workouts and occasionally left the house with a bare wrist. While I didn’t love my Apple Watch, I did find that, on those days without it, I missed its presence. This left me at a crossroads, which is where I might still be were it not for a fateful detour while shopping for Christmas gifts late last year. It was one watch in particular, a model called the Runwell Chrono, that caught my eye. The ardor I had hoped I could kindle for my Apple Watch through the addition of straps and customized watch faces hit me the instant I saw the Runwell. At a retail price of $750, it was a fair bit more expensive than the starting price of my stainless steel Apple Watch; and, as an analog watch, its feature-set was infinitely more limited. So my desire for the Runwell Chrono didn’t make a whole lot of logical sense, yet I wanted it intensely and, after thinking it over for a day, I went ahead and bought one. Here’s the watch I fell in love with at first sight on a fateful night in November: The 41 mm Shinola Runwell Chrono with a cool grey dial and brushed stainless steel case. The Apple Watch feature I used most frequently was its countdown timer to time the steeping of my morning cup of tea and my afternoon cup of joe (brewed via a French press). As someone who knew nothing about watches at the time, I never even considered that an analog timepiece could fill that role without forcing me to perform mental gymnastics until I encountered the beautiful Runwell Chrono. I should note that the watch is shown here on a killer aftermarket NATO strap from a company called ToxicNATOs—at just $18 USD, it was an incredibly cost effective way to personalize the watch to suit my style. The day I picked up my Runwell Chrono is the last day I wore my Apple Watch. True to my OCD inclinations, I’ve since purchased three more analog watches, and a highlight of my mornings now is deciding which I’ll don for the day. That feeling of an “obligation to wear” that I mentioned earlier in connection with my Apple Watch is history, replaced by an eagerness to wear and use my quartet of beautiful little time machines. And it’s worth mentioning that this change in perspective is not a function of price: Of my analog watches, all but the Shinola cost considerably less than my Apple Watch. So, what’s going on here? Why would a self-professed geek and longtime fan of Apple’s design aesthetic eschew the future and instead embrace the now anachronistic “dumb” watch? I have a theory. Longtime readers of this site will know that I’m a big fan of Clayton Christensen’s “job to be done” approach to product creation. For those unfamiliar with this, Christensen is a Harvard Business School professor and longtime business consultant who’s perhaps best known for his book The Innovator’s Dilemma, which was published in the late-90s and introduced a generation of soon-to-be dotcom entrepreneurs to the theory of disruptive innovation. There’s been some debate in recent years as to the validity of this theory, but it’s proven its utility to me and his book remains the one and only business tome on my bookshelf. In short, McDonald’s assumed that customers were primarily buying milkshakes for their flavor and nutrition—seemingly safe assumptions—but efforts to boost sales through improvements to these attributes had little impact. So McDonald’s brought Christensen and his team in to help and, through on-the-ground observation and one-on-one interviews, they came to understand that fully half of all milkshake buyers primarily purchased the product to keep them occupied and interested during their morning commutes to work. According to these customers, the leading requirements for this job included easy consumption with one hand; an item that would take about as long as their commute to fully consume; and staying power, meaning that it should keep them full past 10am. Flavor mattered, but it was table stakes—helping car commuters stave off boredom was where the opportunity for differentiation and growth lay. By re-formulating their milkshakes to deliver on the actual job that customers were hiring the product to do—for example, by incorporating chunks of fruit into their milkshakes, not to make them healthier, but to make them more unpredictable and interesting to consume—Christensen claims that McDonald’s saw a 4x increase in sales. Another critical insight that Christensen’s team brought to light was that the market opportunity for milkshakes was far larger than McDonald’s had previously recognized. Their competitive set was not milkshakes from Burger King or Wendy’s, it was the universe of breakfast items that could be consumed on-the-go—from bagels to bananas—meaning that the potential return from investing in innovation against milkshakes was significantly greater than McDonald’s had anticipated. So, what does all this have to do with Apple Watch? Well, I had assumed that my creeping disaffection for the device was simply down to my personal preferences in fashion and function. But in the months following my review, I noticed an increasing volume of tweets and blog posts expressing sentiments regarding the Watch that were strikingly similar to my own (this was particularly true in February of 2016, as people who received Apple Watch as a holiday gift realized that they didn’t particularly like it). This suggested that the issue went beyond a simple matter of individual taste, which encouraged me to re-examine my experience with Apple Watch through the lens of Christensen’s jobs-to-be-done ethos. As the name and form of the device suggest, the folks in Cupertino believed Apple Watch would subsume the role of a wristwatch—a seemingly safe assumption given that Apple Watch would have to gentrify the same physical real-estate on the body. But I believe that, in this core assumption, Apple has made the same mistake that McDonald’s initially made in assuming that their competition was other milkshakes. If you compare the reasons people hire a wristwatch to the aspects of Apple Watch that proponents value, it becomes clear that these are two very different jobs with two very different sets of qualifications. This is something of a tangent, but I feel compelled to comment on Jean-Claude Biver’s quote at the end of that snippet—it might sound like a whole lot of hot air, but these notions of timelessness and “eternity in a box” have deeply resonated with me. We live in an age in which our machines penalize us for use: The battery life indicator on our phones shrinks with each glance at the status bar and, whether you drive an internal combustion or electric car, each press of the accelerator diminishes your range. A self-winding “automatic” watch, on the other hand, is singular amongst machines in that it rewards use by charging itself with each movement of your arm—no batteries required. I’ve found this symbiosis of man and machine, and the idea that, in theory at least, an automatic will run forever so long as I keep wearing it, both poignant and liberating. Which explains why my auto-winding watches get a lot more wrist-time these days than my quartz-based Shinola—the watch I fell for at first sight that, unfortunately, requires a battery (to be fair, though, the two year replacement interval of the battery in my Shinola is a heck of a lot easier to live with than the nightly charging required for Apple Watch). Of the automatic watches I’ve purchased since falling headlong into the world of mechanical watch enthusiasm, this is my favorite: The Seiko 6117-6400 World Time circa 1972 (for the strap junkies in the house, it’s shown here on a dark clay calfskin strap from Hodinkee). I managed to find this gem via a site called Watchuseek, which features an incredibly popular forum for veteran and aspiring watch geeks alike. Rather than going into detail on the 6117-6400 here, I’ll direct anyone who’s interested to an excellent backgrounder published by yet another fantastic site for watch enthusiasts called Analog/Shift. I can’t help but smile every time I look at this beauty—it just makes me feel good, and that’s the real job most anyone buying an analog watch today is hiring it to do. My pre-mechanical-watch-wearing-self would have pooh-poohed Biver’s sentiment, but the proof is in the wearing. Along those lines, and getting back to the substance of the snippet, I would argue that, today, this job of serving as a deeply symbolic and highly visible totem of one’s values applies not only to $30,000 Swiss timepieces, but to watches at all price points. After all, as the article attests, “nobody needs a watch to know the time,” so whether you’re rocking a utilitarian $200 Seiko SKX007 or an unapologetically OTT $87,500 Ulysse Nardin Freak Cruiser, for the overwhelming majority of contemporary buyers, timekeeping is very much a secondary requirement to self expression. If you need any more evidence to back this up, just ask any watch fan in your life why he or she purchased the piece they’re wearing at that moment, and you’re almost certain to hear some variation of: “It makes me feel good.” In other words, when it comes to watches, it’s less about what it does and more about how it makes you feel. I have been reporting on Apple for more than 20 years now, and in all that time no product has had such an impact on my life as this little piece of hardware and software. I don’t say that for dramatic effect, it has had a profound effect on the way I live. And, in case you think this reason for loving Apple Watch applies only to the geeky tech bloggers of the world, I refer you to this more recent review of Apple Watch Series 2 by a very different sort of blogger named Kath, who describes herself as “a Registered Dietician, healthy eater, and mom from Charlottesville, VA”: Why I Love My Apple Watch. Of the eight reasons Kath cites, her top three are rooted in fitness tracking, and all eight involve specific features of the Watch, such as its ability to alert her to notifications received on her smartphone. Reading positive reviews of Apple Watch like these, a consistent theme that emerges is that the job satisfied buyers have found for the device has little to do with the way it makes them feel as an object, and almost everything to do with its functionality—particularly, its functionality as an activity and fitness tracker. To this point, the closing to Kath’s review is telling—she writes, “…I do hear there are some new generation Fitbits and things that do similar things! Do you have an activity tracker? Love it?” So, even though Kath refers to the device as Apple Watch throughout her review, it’s evident that she views it not as a watch, but as an activity tracker. In summary, like McDonald’s, which initially assumed that their competitive set for milkshakes was other milkshakes, Apple has conceived Apple Watch around the assumption that their competitive set is other watches. Reading positive reviews like Kath’s and Dalrymple’s—and re-examining my own, more ambivalent experience—it’s clear that this assumption is incorrect. At this point you might be asking, why does it matter? While I and others who seem to fall squarely into the target audience for the device have found it wanting, clearly, there are people out there who are very happy with Apple Watch. Who cares if the reasons they like it have nothing to do with its “watch-y-ness” and everything to do with its capabilities as an activity tracker? As a product manager, the reason to care is that this mis-alignment between your job description—aka the brief—and the actual job people out in the real world are hiring your product to do is a red flag signaling missed opportunity. As Christensen noted, his team was able to help McDonalds increase milkshake sales four-fold by simply aligning the brief for the product to its actual job to be done. I believe Apple has a similar sort of opportunity with Apple Watch, but with an exponentially greater potential return—both financially and in terms of societal impact. As someone who, like Siegler, wants to see Apple succeed, I agree that Apple Watch must get better than it is now. And, as a product manager who knows that a product is only as good as its brief, I believe that won’t happen until Apple shifts its brief away from making a better watch and towards creating an insanely great activity tracker. Apple Watch Series 2 is packed with incredible fitness and health capabilities including a water resistance 50 meter rating for swimming, and built-in GPS so users can now run without an iPhone. While these new capabilities may make Apple Watch a more viable option as a fitness tracker for some, the problem with Apple Watch was never a lack of features. Instead, the problem is that it does too many things—starting with trying to be a watch replacement—and these additions do nothing to address that core failing. This is particularly surprising coming from a company that celebrates its willingness to nix features, and that’s declared on more than one occasion that “there are a thousand ‘no’s’ for every ‘yes’.” That principle seems to apply to the teams working on Mac hardware to a draconian degree, but to the Apple Watch team, not so much. Say NO to being a watch. I may have beat this point to death already, but I think it’s worth emphasizing because this one decision has enormous downstream repercussions on the form and function of the device. To wit, Apple Watch’s screen mimics the dimensions of an analog watch dial and its case closely aligns to the physical dimensions of modern-day mechanical wristwatches. In addition, just like a conventional timepiece, Apple Watch is fastened to the wrist by way of straps that are not integral to the device itself, but can be interchanged with other straps of varying styles. But what if Apple didn’t set out to mimic a watch and instead started from a clean slate, knowing that the primary job to be done by the device was to accurately track its wearer’s activity 24 hours a day, 365 days a year? For starters, I believe such a device could do without a screen, instead relaying all data to the wearer’s smartphone and relying on it for any tasks requiring a graphical interface. Eliminating the screen would dramatically reduce the power requirements of our next-gen wearable, enabling Apple to use its battery capacity in other ways—for example, by simply extending battery life or by shrinking its physical dimensions. Speaking of shrinking, forgoing the screen, as well as the dimensional and fastening conventions of a wristwatch, would also free Apple’s designers to pursue a more diminutive form factor that could be worn alongside a conventional timepiece rather than forcing prospective buyers into an either-or decision. If this idea of wearing a watch on one wrist and an activity tracker on the other sounds outlandish to you, take a few minutes to observe people’s wrists the next time you travel through a major airport—I think you’ll be surprised by how many folks are already doing this, not to mention the even larger population who wear a watch on one wrist and some manner of prominent bracelet or bangle on the other. In short, this doesn’t need to be the zero sum game between watch and activity tracker that Apple’s made it out to be. Yes, Apple has already reduced the price of its base Watch model to $269, but to truly have an impact on health around the world—and not just in the wealthy nations of the world—the Watch needs to get down to a sub-$100 price point as soon as possible. These might sound like impossible requirements, but it turns out that Apple has been shipping a device designed around a very similar set of constraints for over a decade: The iPod Shuffle. When it was introduced way back in 2005, the screen-less, single-purpose, plastic-bodied Shuffle with 1GB of storage retailed for $149 USD. That dropped to $99 by 2006 and, today, you can purchase a new 2GB iPod Shuffle from Apple for $49. So, with a focused brief, Apple can absolutely deliver a simple, highly desirable and highly accessible product for the masses. These values need to become priorities for the device currently known as Apple Watch. Say NO to non-essential features. This is closely related to the point above regarding price point accessibility, but I believe eliminating non-essential features will not only make our next-gen wearable cheaper, it’ll make it better. What features would I eliminate? Basically, anything that doesn’t contribute to making the device an insanely great activity tracker. So, out would go the ability to run apps on the device (since it wouldn’t have a screen, the concept of on-device apps would be moot anyway); the ability to play music from the device; the ability to store or view photos on the device; the ability to initiate or receive phone calls or messages via the device; and the ability to use the device to make contact-less payments. Some of these features are cool, but they all detract from the core job-to-be-done by adding cost, complexity or a combination of the two, and they can all be done more effectively via a smartphone. With those non-essentials out of the way, I’d have the product team focus all of its energies on five key priorities: Making the device small and comfortable enough to be worn 24 hours a day, 365 days a year; enabling it to be charged while it’s being worn (see the WHOOP Strap for one way to do this); making the device the most capable and accurate in the industry at sensing and tracking the physiological signals associated with health and wellness over time; developing a dead simple haptic “interface” for interaction with the device; and getting its price to no more than $149 USD at launch, and to less than $100 USD within three years of launch. Say NO to iPhone exclusivity. This one is simple: If Tim Cook means it when he says “health is something that is a huge problem in the world” and that he’d like to see Apple contribute to solving the problem, Apple’s activity tracker must work with Android devices, which comprised 81.7% of global smartphone sales in the fourth quarter of 2016. While some may see this as a capitulation, I see tremendous upside for Apple in this shift. Much in the way that iPod served as a Trojan Horse into the Wintel hegemony, helping Apple win back PC market share through the 2000s, our re-imagined activity tracker would introduce the benefits of Apple’s ecosystem to a generation that’s grown up with Android, creating an opportunity to spur iPhone sales. Say YES to a renewed commitment to software. One thing shared between Jim Dalrymple’s glowing review of Apple Watch and Tim Cook’s commentary on the device from Startup Fest Europe is that they both mentioned a software platform called HealthKit. HealthKit isn’t an app, but a framework created by Apple that developers can use to store activity and fitness data captured by their apps. This structured, secure and centralized repository enables health and fitness apps to share data with each other, while offering end-users visibility and control over that inter-app sharing. As end-users, we don’t directly interact with HealthKit—instead, for the vast majority of iPhone users, our window into that data is the Health app that comes bundled with iOS. And herein lies the problem, because the Health app is, in a literal sense, dumb. I started using HealthKit every day to see how different things would affect my weight loss and generally how I felt. Did I lose more weight walking in the morning or the afternoon? What foods made me gain weight? Should I skip meals and hope that helps with weight loss? I hesitate to say I became obsessed, but I did become more aware of what I did and how it affected me, both physically and mentally. Dalrymple was sufficiently motivated to keep track of all of these associations manually, which is fortunate because Apple’s Health app offers no help in this department. In its current incarnation, it’s little more than a dashboard that displays information that, on its own, is of almost no value. What if, instead of being a dumb repository, Health became a smart advisor? So, in Dalrymple’s scenario, it could have connected the dots on his behalf and advised that, for him, morning walks appear to contribute to greater weight loss than afternoon walks. I’m not privy to Dalrymple’s activity and fitness data so that’s a hypothetical example, but hopefully you get my drift. I’ve also found that my Watch can give me advance warning of illness. On two occasions, I noticed that my heart rate was roughly five beats-per-minute higher than it would normally be during a given activity. I wasn’t exhibiting any outward signs of sickness at the time of these measurements, but, on both occasions, I began to show typical cold symptoms within a couple of days. I was only aware of this because I’m a data geek and was keeping track of changes in my heart rate over time. Imagine how useful the Health app could be to the non-data geeks of the world if it could pro-actively share insights like these. For example, the app could have told me that I’m exhibiting early signs of a cold and pointed me to a credible reference on effective interventions, thereby helping me to moderate the severity or duration of my symptoms. Along these lines, the “Today” screen of iOS, which currently displays things like the weather, upcoming calendar events and news stories that Apple thinks I might be interested in, should be updated to include individually tailored suggestions related to health and fitness. For example, based on data from my next-gen Apple wearable—which I’d be able to wear while sleeping to track sleep quality—combined with my health history and my calendar, my phone might advise me to switch my run to the morning instead of my typical afternoon slot in order to maximize productivity for the day. Here’s another scenario that would help improve my life: Knowing, based on my calendar or the travel itineraries I’ve received via email, that I have a trip to Japan coming up in two weeks, the Health app could offer me a revised sleep schedule that incrementally acclimatizes me to that new time zone. This wouldn’t be a cookie-cutter plan—instead, it would be tailored specifically to my needs based on my historical sleep and health data. If I were to accept the suggestion, the phone would automatically edit my “do not disturb” and alarm settings, eliminating the need for any manual interventions on my part. The net result would be a dramatic reduction in my jet lag while on the ground in Japan, enabling a much more productive and enjoyable trip. The bottom line here is that hardware is only one piece of the puzzle. Whereas Apple currently appears to be devoting about 80% of their efforts in the health space towards hardware and 20% towards software (and that’s a generous assessment), I believe that split needs to be closer to 50/50 in order to unlock the sort of world-changing potential that Tim Cook talks about. Wow, if you’ve made it this far, I’m impressed—thanks for sticking with me! If you’re wondering why in the world I put so much energy into a piece that has a snowball’s chance in hell of getting in front of anyone at Apple who might actually read it and be in a position to effect change, it’s because I agree with Tim Cook that health is a critical global issue and that Apple is uniquely positioned to make a meaningful dent in the problem. Aside from the negative impacts on the well-being of affected individuals and their loved ones, obesity is also hurting the U.S. economy, according to a 2015 report from Bloomberg Businessweek. The magazine cites research from Cornell University economics professor John Cawley, indicating that “obesity raised medical-care costs by $315.8 billion in 2010,” an inflation adjusted increase of 48 percent compared to 2005. And, lest you think that burden falls only on those who are obese, according to Cawley, “the costs are usually paid by private and public health insurance, meaning that leaner people are subsidizing those with less healthy diets.” In other words, “All of us are paying these costs." The maddening thing about this is that, as the WHO rather dryly notes, “Overweight and obesity, as well as their related noncommunicable diseases, are largely preventable.” I don’t believe that wearable, activity tracking tech is the panacea for this pandemic, but I’ve read and heard enough accounts like Dalrymple’s to be convinced that it can be a significant part of the solution. Speaking of solutions, the WHO’s recommendation to governments is quite simple: “make regular physical activity and healthier dietary choices available, affordable and easily accessible to everyone, particularly to the poorest individuals.” To me, this should become the mantra adopted by the Apple Watch team: Stop trying to make a next-generation watch, and focus instead on creating a next-generation activity tracker—Health app included—that’s “available, affordable and easily accessible to everyone,” and doesn’t just surface data but provides ongoing, individually tailored coaching that helps its users lead healthier, more productive lives. Various companies have the chops to tackle parts of this enigma, which is equal parts tech and human behavior. Google comes to mind most immediately given their deep capabilities in cloud services and artificial intelligence, as does Facebook for their expertise in social influence, but I believe only Apple has the blend of engineering prowess and appreciation for the humanities—the intersection of technology and the liberal arts that Steve Jobs often emphasized—necessary to pull this off at scale. To do so, however, the company will need to “think different” about their approach to Apple Watch. For all our sakes, here’s to hoping they find the courage to start fresh and truly confront the most significant global health challenge of our time. Agree? Disagree? Have questions? Let’s continue the conversation on Twitter @edotkim.